The main objective of the project was to produce an animated typeface using the TYPuzzle system that could then be used to produce longer pieces of motion type. 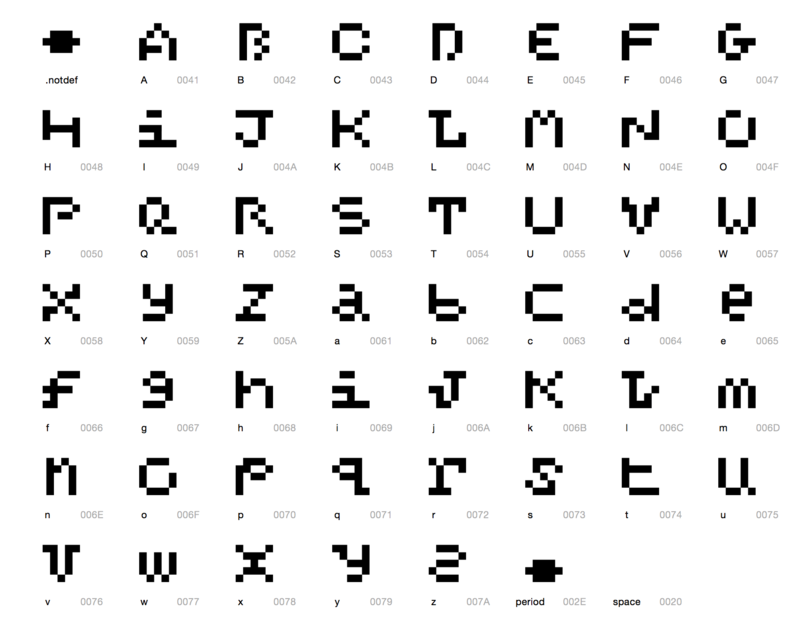 This table displays a full alphabet of transitions between all glyph combination. Each transition is a looped animated GIF going from one letter to another and then back again. As the table shows there are still a few missing combinations: A-L, A-P, A-Z, B-X, B-Z, D-K, D-L, G-M, J-Y, L-R, S-X, U-W, W-X. This table was displayed within the Dev Lab space alongside the puzzle installation. A to Z of animated glyphs produced using the TYPuzzle. Although the installation had technical limitations at turning the public’s interaction with the analogue interface into digital animated type, the modular puzzle system proved unexpectedly flexible for designing letter forms. As ever a simple grid can generate a variety of design permutations, with a handful of forms easily designed for each letter. Although there were technical limitations attached to turning interaction with the analogue interface into digital animated type, the modular puzzle system proved unexpectedly flexible for designing letter forms. A simple 5 by 5 grid of 11 black squares and 14 white squares was able generate a variety of design permutations, with a handful of forms easily designed for each letter. The next objective of the project is to produce an OpenType font curated from letter forms produced by the TYPuzzle system. A basic character set has been designed, and is available for free download. Basic set of glyphs from the OTF. A particular favourite is this very “kicking” K designed by ex Liverpool graphic design and illustration students. K designed by Lottie Brzozowski, Jenny Stuttard and Rachel Davey.